Review by AllTheBestFights.com: 2016-01-23, fight not so exciting between Dominic Boesel and Balazs Kelemen: it gets two stars. The undefeated Dominic Boesel entered this fight with a perfect boxing record of 20-0-0 (7 knockouts) and he is ranked as the No.35 light heavyweight in the world. He fought three times last year beating Maximiliano Jorge Gomez in his last bout. His opponent, Balazs Kelemen, has an official record of 24-1-0 (13 knockouts) and he entered as the No.87 super middleweight. He suffered his only loss last year when he faced Vincent Feigenbutz, after this fight he came back to win defeating Robert Talarek and Mikheil Khutsishvili. 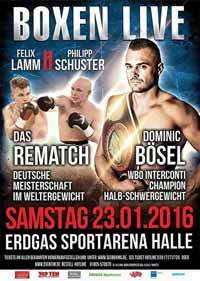 Boesel vs Kelemen is valid for the WBO Inter-Continental and vacant WBA Continental light heavyweight titles. Watch the video and rate this fight!